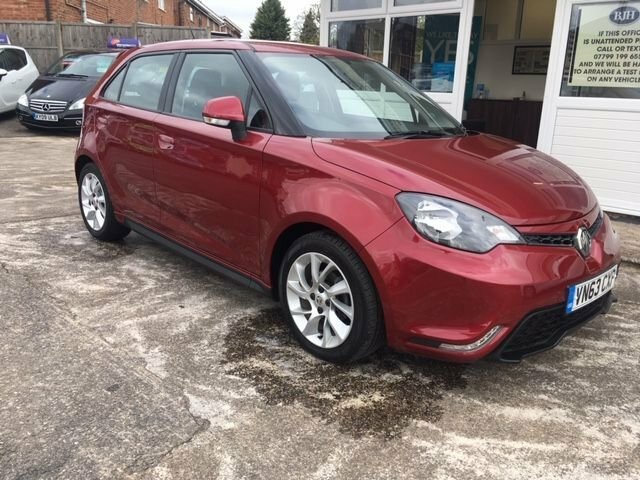 Having covered only 30,000 miles since brand new, this superb value for money 2013 MG 3 1.5 VTI Tech is finished in dazzling Rioja Red Metallic - it is a 5 dr hatchback that comes fully equipped with Alloys, Bluetooth, Digital Climate Control, USB/Aux, Red/ Grey Interior, Electric Mirrors, Electric Windows, Leather M/F Wheel, Power Steering, ESP, 5 Speed Gearbox, 2 Keys, Daytime LED Lights etc etc- 3 Stamps in the FSH book and just insurance group 4!! Sleek styling and a spacious and comfortable interior ensure the MG 3 is an impressive offering in the supermini class. This five-door hatchback features plenty of equipment as standard and comes with a useful boot that'll make day-to-day life a lot simpler. To discover whether one of the used MG 3 models for sale in Worcester is the right fit for your lifestyle and budget, be sure to arrange a test drive by contacting a member of the team at BJH Motors and Sons right now. You can also view our complete stock of quality used cars here on the website. We're proud to offer unrivalled customer service and will ensure you find the perfect model to suit your requirements.